NOTD: L'Oreal Paris Color Riche "Marie Antoinette 202"
NOTD: Rimmel Stars 60 sec "Star Studded"
I took out something light today as I have a wedding reception to go to on Saturday and wanted to make sure my nails is tip-top for any polish I may choose to wear. 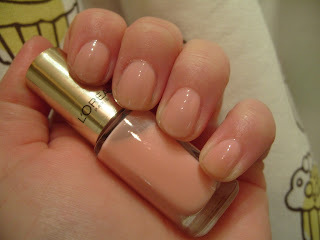 This is 2 coats and you can still see a bit of my stained nails... Oops. Oh well. You certainly can't see it when you are not in macro mode so it'll do :) I slicked on a quick coat of MegaShine as usual. It's a super-sparkly white, but due to it's advancing age it's a bit thick and messy to paint with... 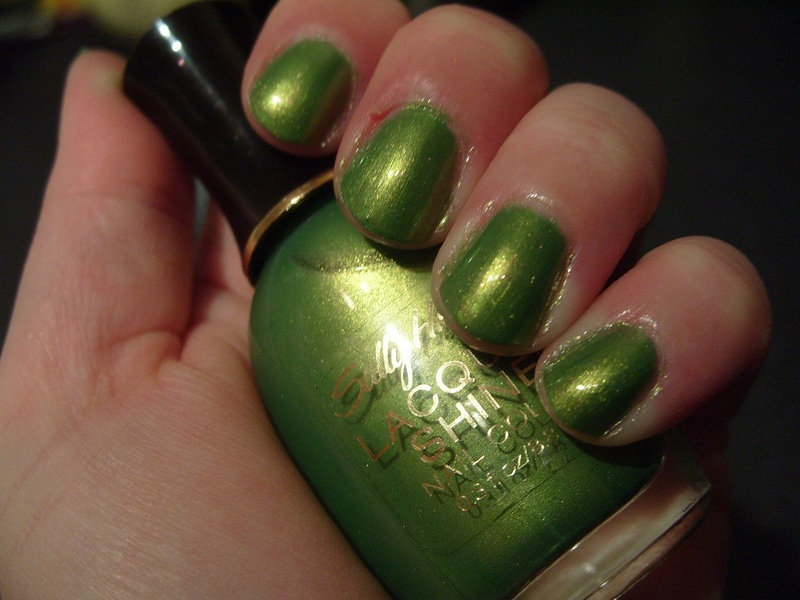 I need to use some Seche Restore on this polish. "Star Studded" is a bit like Color Club "Snowflakes" but much smaller glitter particles. 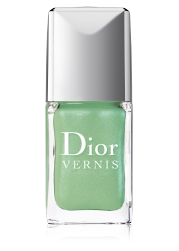 This fab new green polish is part of the Boots 17 spring collection I believe. I don't have a polish in this colour so I got it. This is 3 coats and a coat of MegaShine. 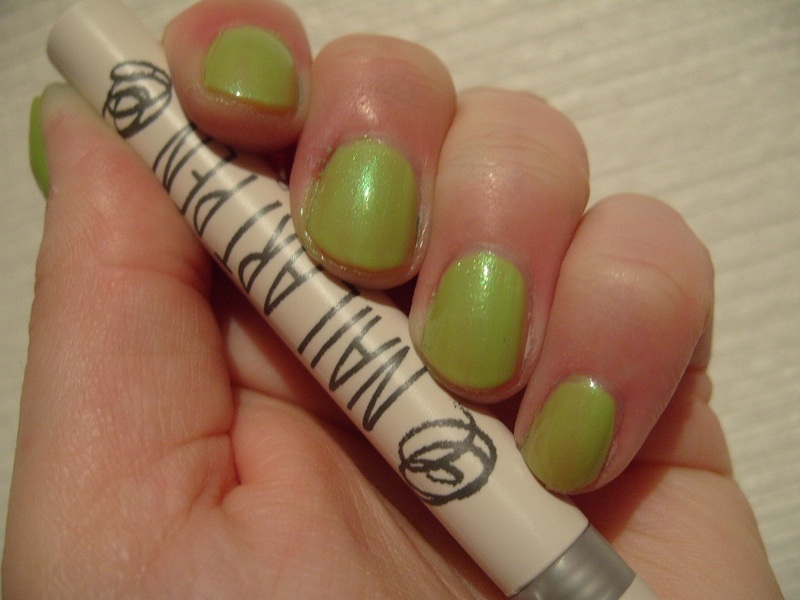 I was going to do some funky nail art tips with my new Topshop nail art pen in "Visionary", but the polish is too soft right now; the tip of the nail art pen is VERY hard and sharp so would scratch right through the polish. I might jazz up the tips tomorrow with "Visionary" when the polish is fully hardened. 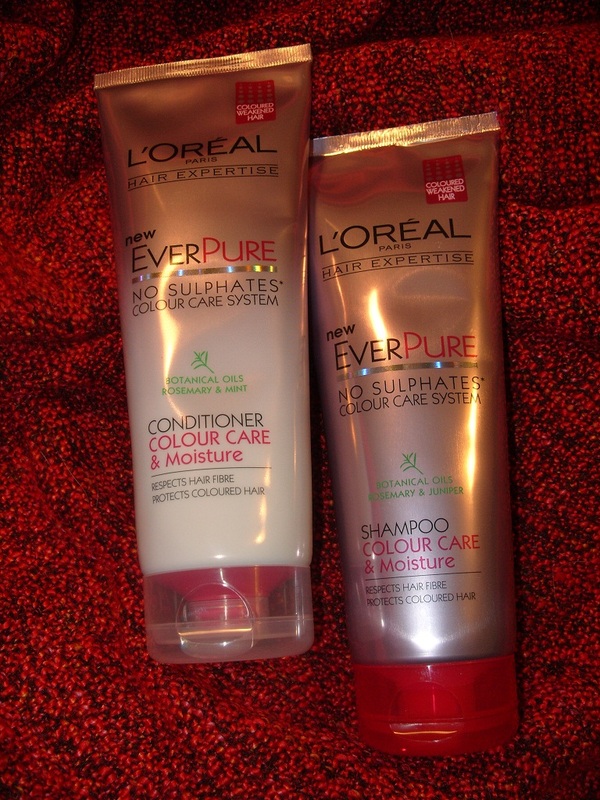 I have been trying lots of new stuff over the weekend, most of it from my Joliebox (formely Boudoir Prive), but I also go some of the new L'oreal shampoo + conditioner, EverPure! I chose the Colour Care for dry hair formula. I love the light scent - the shampoo is subtly herby (rosemary and juniper) and the conditioner has a minty kick (rosemary and mint) to it. It lathers a lot for a sulphate free formula shampoo?? My hair seems to like this series as it's shiny, soft and tanglefree. But I am not a fan of the tube bottles. They are made of something almost metallic, and thus they crinkle up which makes them unattractive; it's may just be me but I prefer a bottle any day! I suppose the packaging is different from the Elvive bottles as they are marketed to a different demographic. But I am still liking this shampoo + conditioner, and I will continue to use it and hopefully have an updated review for you in a couple of weeks. So it finally arrived! 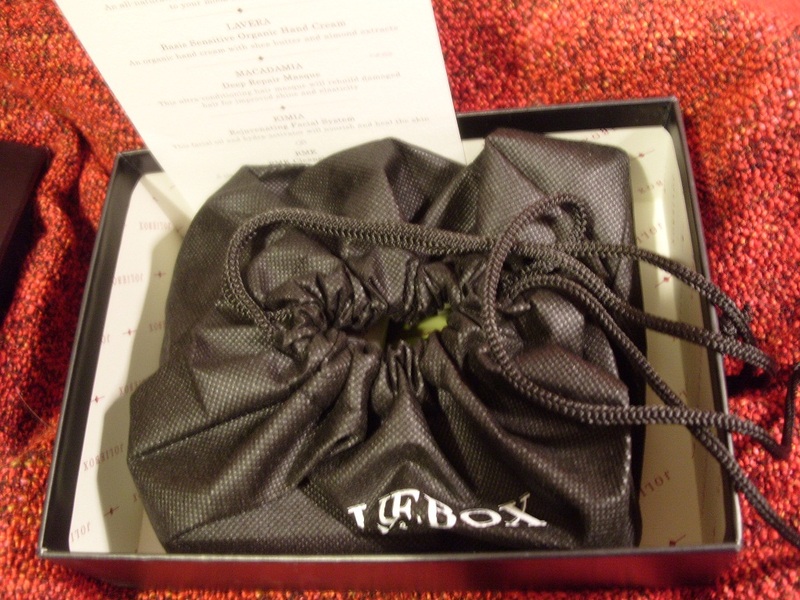 February's Joliebox introduces a drawstring bag inside now to hold all the samples instead of the crinkly paper wiggles and the tissue paper. A nice touch, but perhaps a bit wasteful?.. I can recycle the paper shreddings and re-use the tissue paper to pack stuff but I'm probably just going to keep the little bag just because it's a waste to throw it in the bin. Taaj Micellar Tonic Makeup Remover will be a new experience for me - I've not tried any of the new micellar removers! I have no cotton rounds at the moment so I will wait to try it until I get some more. 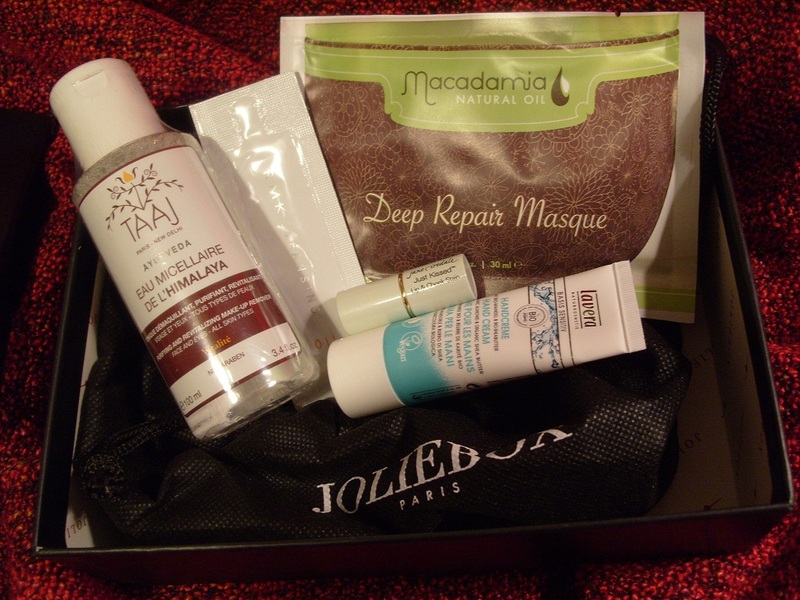 It's the biggest sample in the box - I would have liked a bigger sample of the hand cream if I'd had a choice, but after trying it I might change my mind. I am looking forward to trying the Macadamia Natural Oil Deep Repair Hair Masque. My hair needs some pampering now. Off topic, I am trying the new L'Oreal EverPure Shampoo and Conditioner tomorrow, I got them in Boots today. They are any 2 for £9 at the moment. The RMK Cleansing Oil is calling to me - I love the Shu Uemura Cleansing Oils so I am hopeful for this one! 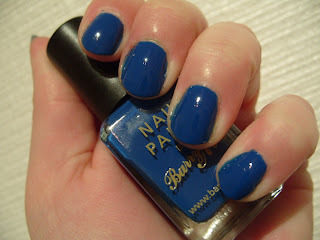 NOTD: Barry M "Cobalt Blue"
So this has been in my stash for, eh, 3 years?.. I've frankened with it. That's it. Not that that franken was a bad effort but I'm stumped now that it's on why I've never worn it on it's own. It's gorgeous! It all started this morning on the bus when I got an email from Nails Inc going on about their cobalt blue "Baker St" and how it's the polish right du jour. So I went onto the website and there was a news snippet that "Baker St" was the first polish Beyonce wore in public after having her lovely little sprout Blue Ivy. I thought 'hey, I have a Barry M just like that one'.. So here it is! This is 2 coats - you only need one! A bit gloopy but that may just be due to age. 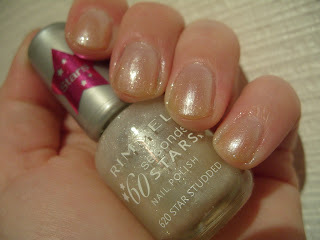 Lovely and shiny without top coat, but you know me, I need to have my quick-dry fix! NOTD: Sally Hansen Lacquer Shine "Glow"
So the snow arrived overnight! :) I am wondering whether to put a blanket on my poor crocus and snowdrops that have sprung up! My NOTD is probably a cry for summer to arrive already. I've been plagued by colds and flus this winter and general low immune system so I am so ready for some brilliant sunshine and nestling my toes in warm grass... I watched the live stream of Topshop UNIQUE A/W today, and felt it was dark and dreary and a bit 'steampunk' for my liking?.. But the model's hair was like mine - wash, don't brush, let dry naturally and et voila - hair in all directions with fly aways and dodgy partings. So I won't need to be trying to look cool next A/W, I will just have to "wash n' go" as usual! Anyway, back to my NOTD. This is 3 coats of "Glow" with a slick of MegaShine top coat. You have to be careful or you end up with a very brush-strokey finish. Please ignore the sore hangnail, I got it after a paper cut at work :( I love these golden-greens, I have a lot of similar ones including the coveted China Glaze "Moonpool". CrystalPolish has done a brilliant comparison of "Moonpool", SH "Glow" and L'Oreal "B.Strong", in case you want to see them side by side. 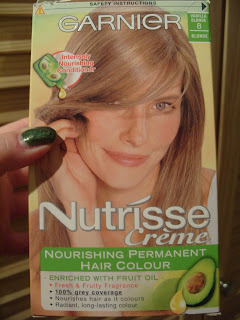 My number one most popular post is the one about my home hair colour disaster! The world LOOOOVES to hate home hair colour. Well, I guess I should too because since that day 3 years ago, I have been colouring my hair - at home. I am not at which stage last summer I decided that it would be a good idea to go even blonder than I am naturally... I don't know what I was thinking. The white-blonde happiness was brief. I then spent a long time trying to cover roots. Anyway. I decided it was time to go back to my honey blonde 'roots'. 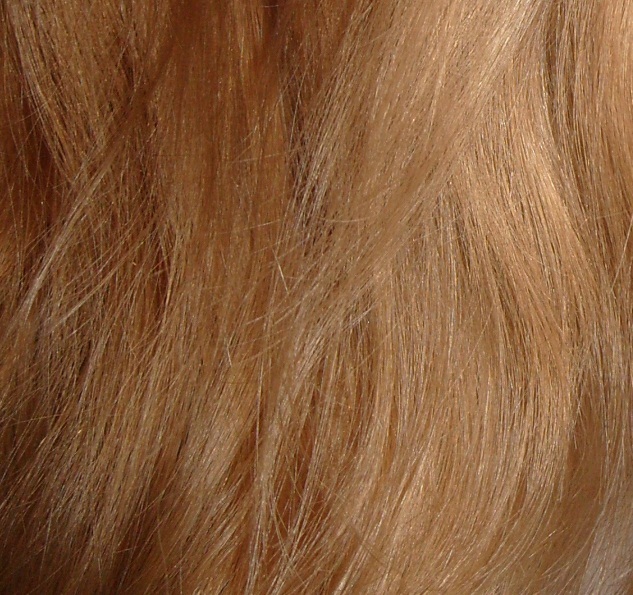 But I decided I needed a darker honey blonde, as I think I am going darker as I age (shock! horror!). So I decided on Garnier Nutrisse Creme in the shade "8.0 Vanilla Blonde". 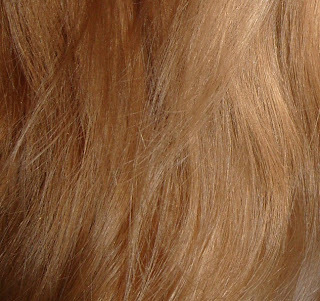 It is a golden medium blonde shade. So a little review on how the application is. It's your standard 'squeeze-the-tube-in-the-bottle' hair colourant. It's easy to mix in the bottle and because it's very gooey it sticks to your hair and doesn't drip. The first whiffs of this stuff isn't too offensive but whoa - once it kind of gets going it is very strong. I had to open the bathroom window as I thought I was going to choke to death. 25 minutes later and rinsing time. You lather it up and rinse it out. My hair didn't have that steel-wool feel. It felt soft. And that was even before the deep conditioner! After the conditioner, it was super-soft. I waited for it to dry - and I like it :) My hair is just that shade darker honey blonde that I was hoping for. I tried to photograph before and after of the same bit of my hair but it didn't come out very well but lets just say my result is very close to the box! I told you I had something special coming in the post, and here it is! :) I saw swatches of this and realised I really really needed it! 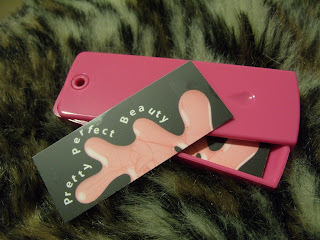 A-England is a boutique nail polish brand from the UK, causing a stir in the nail fanatic world. It you search 'a-england swatches' in Google images, you are in for a treat. They have so many gorgeous shades! 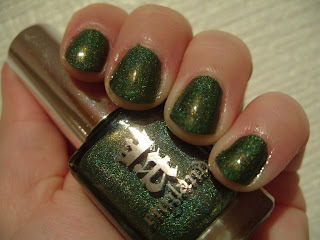 "Dragon" is an aptly named green with a golden flash, almost duochrome, and scattered holo particles. It's completely unique! This is 1 thickish coat and a slick of MegaShine. The only gripe I have with this polish is that the brush was very straggly and uneven, so I had to trim it before I could use it. Anyway. 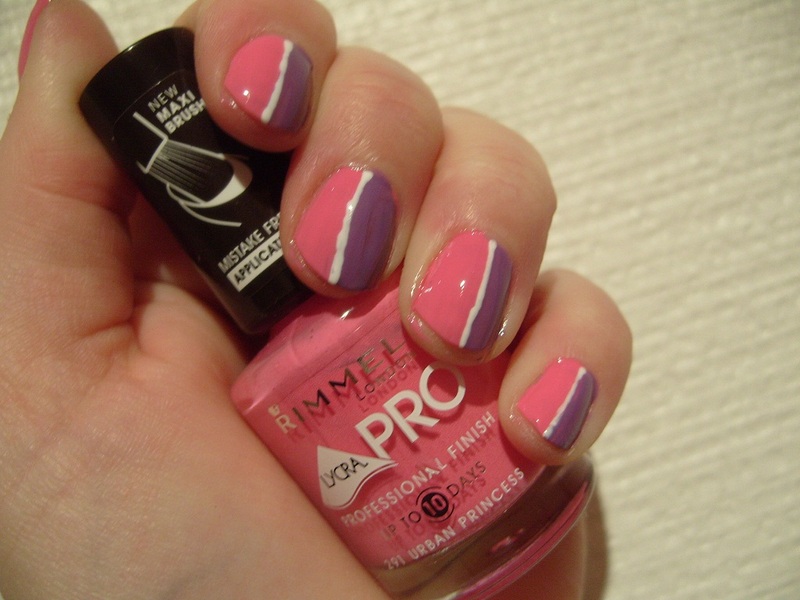 The pink side is my old trusty Rimmel LycroPRO "Urban Princess" and the purple side is the gorgeous GOSH "Wild Lilac". The white nail art striper is from a brand called Janet Paris, I've never heard of them, I believe I bought it in a bargain-price cosmetics shop in York last year. 2 coats of each then the striper then a slick of MegaShine to seal it all in :) I think I will wear my yellow sweater with this tomorrow just to add to the colour popping. I'm still very unwell with this cold/flu and in between flat-out sleeping and dozing watching bad day-time TV, I decided to paint my nails... 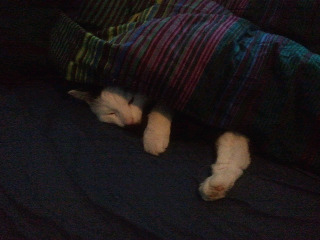 Shouldn't have. The fumes made me cough like crazy! My eyes were streaming. Finally after an hour of juggling drying polish layers and Kleenex tissues for my dripping nose, I finally slicked on MegaShine and crashed onto the sofa with the cat. My goodness, doing manicures is hard work when your body isn't well.. 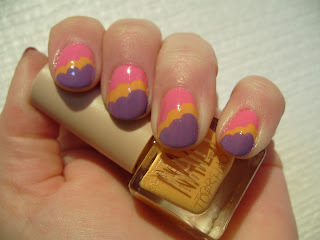 I used Rimmel LycraPRO "Urban Princess" for the pink, Topshop "Summit" for the yellow (looks orange!) and GOSH "Wild Lilac" for the purple. I wanted to put on a fourth colour, the pastel blue beauty Bloom "Kate", but when I finished "Wild Lilac" I felt so ill I couldn't continue. I may add it in tomorrow. I got the idea for this mani from the talented Dutch lady who has the Nailside blog :) She has a tutorial there, you should check it out! Her nails are enviously perfect and she has some seriously ace nail art ideas. I think I also want a pair of these sandals - maybe they can save my poor feet from fashionable footwear?? 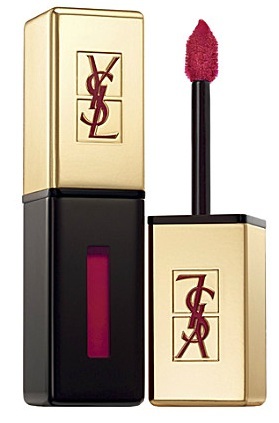 YSL Rouge pur Couture Glossy Stain lip stain in "11"
It just looks so spring-like and happy, just looking at other peoples swatches makes me temporarily forget my red-raw nose and pounding head. Have you managed to get hold of "Waterlily"?? 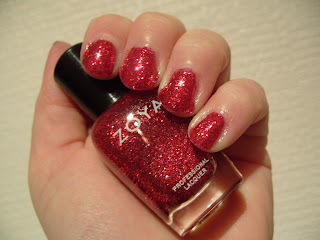 "Astra" is from the Ultra Glitter collection from Zoya. I've worn it before, but it's so pretty it deserves to come out to dazzle again :) I used it in some art as well, which is why I decided to put it on! This is 2 coats, could have done with another one, but I couldn't be bothered. I put on 2 coats of top coat, as this is a top coat eating glitter! "Astra" is a red-pink glitter, but not as red as in my photo. 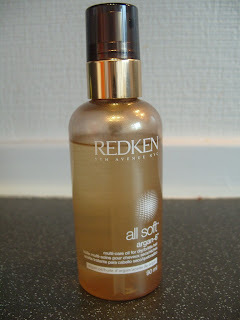 At Xmas I got a bottle of Redken All Soft Argan-6 oil, as my hair was a mess and so dry it was painful... I read a lot of reviews and decided this was my choice among all the fancy hair oils out there! After using it for over a month, every day after washing my hair before blow drying, I can report that my hair is super soft and shiny! The oil smells lovely but you need to slick it on dry hair to reap the lasting smell - on wet hair it doesn't really leave a scent. It's not greasy or heavy; I have very fine blonde hair so if I can use it - anyone can! And here is a peek at something that is coming soon from L'Oreal. I hope to review these as soon as I've tried them! 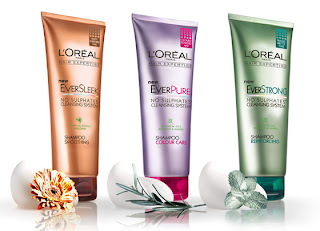 One of my all-time favourite shampoos/conditioners is as you may know L'Oreal's Full Restore 5, so I hope that these measure up as they are supposed to be sulphate-free! 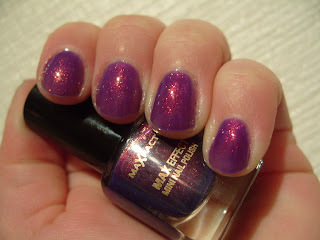 NOTD: Max Factor Mini "Fantasy Fire"
This is what a lot of nail enthusiasts have been hoping is a 'Clarins 230' dupe, but when I look around online, I can see they are similar but not dupes?.. I unfortunately do not have a bottle of '230' to compare with myself. 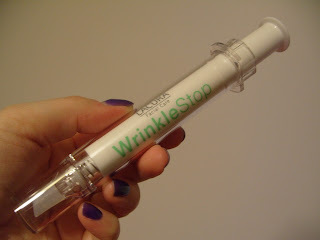 I actually got this by chance in Superdrug today, and I will going back for another bottle! It is absolutely stunning. This photo is 4 coats (I should have layered) but it dried really quickly so doing multiple coats was easy. This is a poor photo of a crappy bunch... It looks lighter and more washed out in the photo. 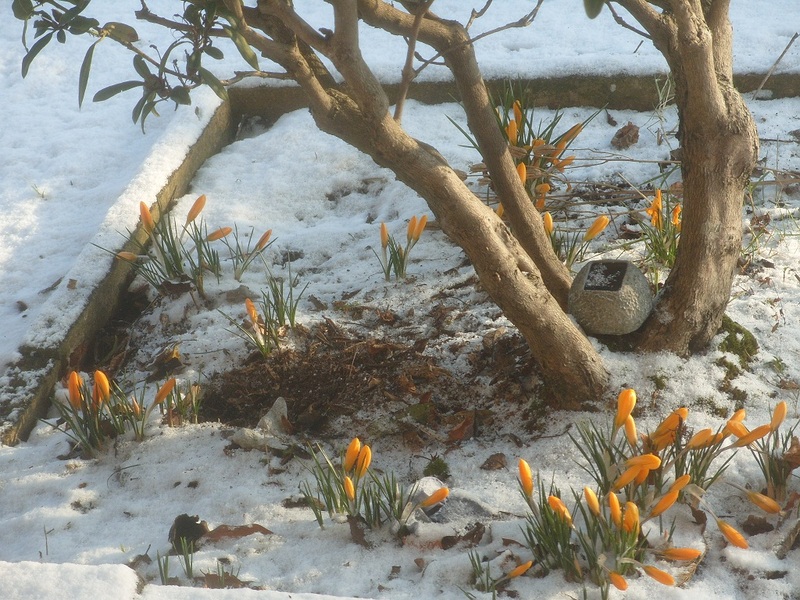 It is sheer to go on but the colour then glows and shifts in colour in the light! But my camera just can't cope with it in artificial light. I will try and get some shots in daylight.